A new wave of dead fish washed up on Kuwait's coast, sparking fears about the safety of eating seafood, according to Al Qabas newspaper. Large quantities of dead fish, locally known as "Al-Ouma", were seen lying on the shore, in an area known as "hospitals' beaches". 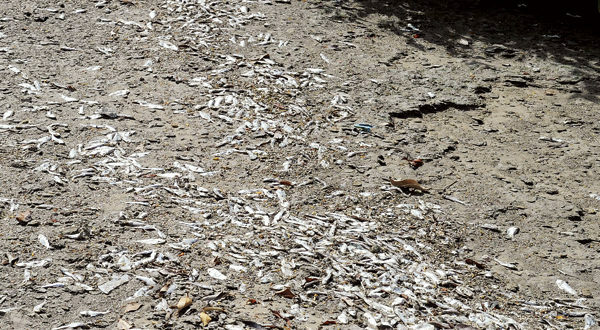 The authorities said that a malicious pathogenic bacteria has been identified as the main cause for the huge quantity of dead fish washing up on the Kuwaiti coast over the past few days. The pathogen is believed to have caused the death of large quantities of fish, particularly to species locally known as "Al Jam" and "Al-Meed". The Public Authority for the Environment announced a few days ago that initial findings of the investigation pointed out the impact of sewage discharge on coastal areas, especially the beaches of Al Salam, Al Showeikh, Al Doha, Ashiraj and Umm Al Namli Island. Earlier this month over five tons of dead fish were removed from Kuwait beaches. More than 5 tones of dead fish removed from Kuwait beaches was originally blamed on sewage and fishermen.